Zalora Hari Raya Haji Sale - Get Extra 20% Off on Baju Kurung! This is for all Muslim readers (yes, I have posts on Hari Raya, and halal food). Actually, this is for anyone interested in getting a lovely baju kurung. 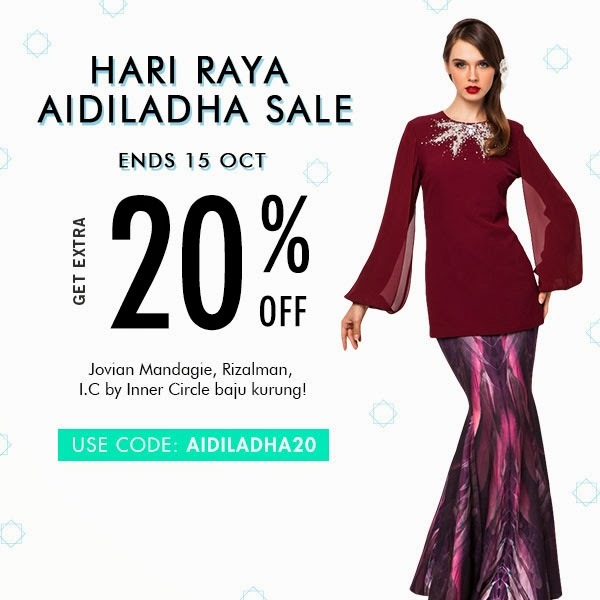 Zalora is offering an extra 20% off designs from Jovian Mandagie, Rizalman, and I.C by Inner Circle, valid until 15 Oct 2013 (2359hrs). Just use the code: AIDILADHA20 on this page - http://www.zalora.sg/hari-raya/. You'll get a voucher which is valid on top of sale items! GTMS - good things must share! I've always thought the baju kurung selection at the pasar malam or bazaars sometimes come across as a bit dated or gaudy, so I was quite surprised to see some pretty nice designs on Zalora. Check it out.